Random Wikipedia is a free Windows 8 Wikipedia app that lets you browse through a random article on Wikipedia and learn about something new everyday. The fun here at this Wikipedia app for Windows 8 is never ending as it keeps on pulling up new and interesting stuff from Wikipedia, pointing out new article everyday. 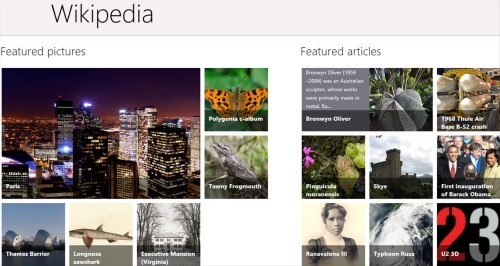 You can easily browse through Wikipedia site using this Windows 8 app. Let me bring out the main features of Random Wikipedia app in brief. Lets you browse through randomly pulled article from Wikipedia site. Lets to browse through Wikipedia website from within the app. Lets you learn something new everyday. In short, Random Wikipedia is a good utility Windows 8 Wikipedia app for those who are regular user of this prominent website. Go ahead and download Random Wikipedia app in Windows 8 now. Also, check out our posts on Search Engine Apps, and Encyclopedia Apps. 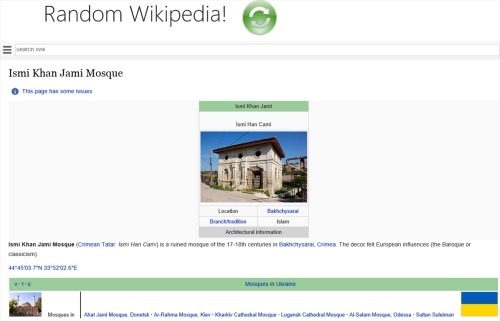 Wikipedia is an official Windows 8 Wikipedia app. It’s a free encyclopedia that brings you over 20 million articles on various topics in 280 languages. Wikipedia has been the most widely used reference since the day it launched. You can easily look for articles on subjects such as history, geography, fiction, science, galaxy, wildlife, celebs’ bios, and many more. The home page of the app shows categories including Featured Pictures, Featured Articles, On This Day, and Recent Changes. Right-click anywhere on the screen, and you will find options to change the language and option to open an article in a browser. You can easily pin articles to start screen, search for specific article, and share articles with using Windows 8’ Share Charm. Also, there is an option to ‘Find in Page’ that lets you find a word or phase in the currently opened article. Its an interesting Windows 8 Wikipedia app that is available under the ‘Books & Reference’ section of its app store. It’s a must-have app for all Wikipedia users. Go ahead and download Wikipedia app in Windows 8 now. 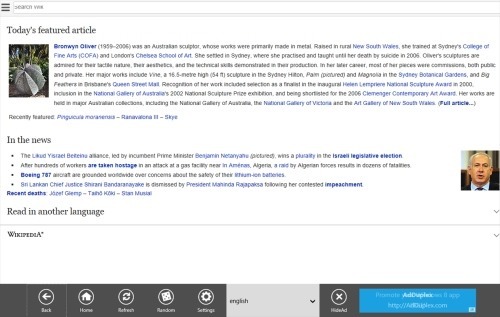 Wikipedia + is yet another Wikipedia Windows 8 app where you will find more than 20 million articles on variety of topics in in different languages. You will find around 280 languages to read articles in. You can search nearby articles, read articles in various languages, perform text search, etc. At the home page of the app, you will find options such as Back, Home, Refresh, Random, Settings, and Language. You can go through these options and access this Wikipedia app in the way you want. In order to download Wikipedia + app in Windows 8, you need to head over to the app store and search for its name. You can now proceed with further installation steps. Go ahead and download Wikipedia + app in Windows 8 now.